Hence after over a year of dating they tied the knot on 27th may, with the approval and presence of their loved ones. On May 26th Sangeet Ceremony – It took place at CASINO HOTEL. The sangeet and wedding planned by the brother of the bride and the bride herself – It’s a BOLLYWOOD DESI THEME. On May 27th Wedding Ceremony – The function took place at Casino Auditorium Thrissur. 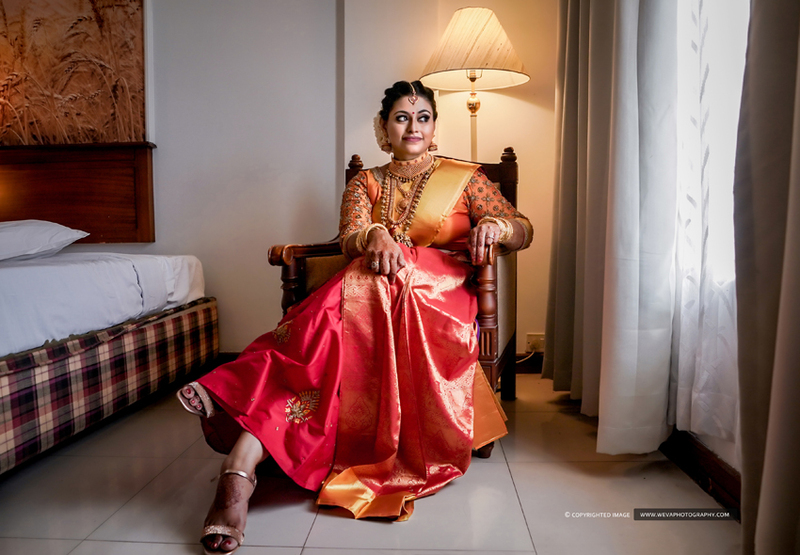 Sneha did not want to do a boring saree as it’s the ritual in South Indian Weddings, she decided to go against norms and don a Lehenga saree, a blend of Kanjeevaram red and gold sari paired with an embroidered lotus skirt and intricate Zardosi embroidered mango yellow blouse designed by DEEPIKA GOVIND (BANGALORE). Followed by Reception on May 28th at Kochi Gymkhana Club. The only event where the groom and bride were colour coordinated. Groom in a blue tux and Bride in a trendy blue gown that seemed to matched well with her sapphire diamond set .. Hence Thanks a lot Sneha and Rageeth for choose us to capture your wonderful day..